Once upon a time, back when console games were bound to cartridges and chunky boxes, basketball games weren’t just about simulation. Sure, we had the likes of NBA Showdown and NBA Live doing their best to recreate the magic of b-ball on your Mega Drive or SNES (and to great success, too), but there was one series we all played, even if we didn’t particularly enjoy the sport itself: the inimitable NBA Jam. It didn’t matter if you didn’t know the rules, because NBA Jam didn’t really have any. It was a local multiplayer gem that has rightfully earned itself a place in the Hall of Fame of timeless sports games. Come on, who didn’t enjoy performing a flaming dunk? 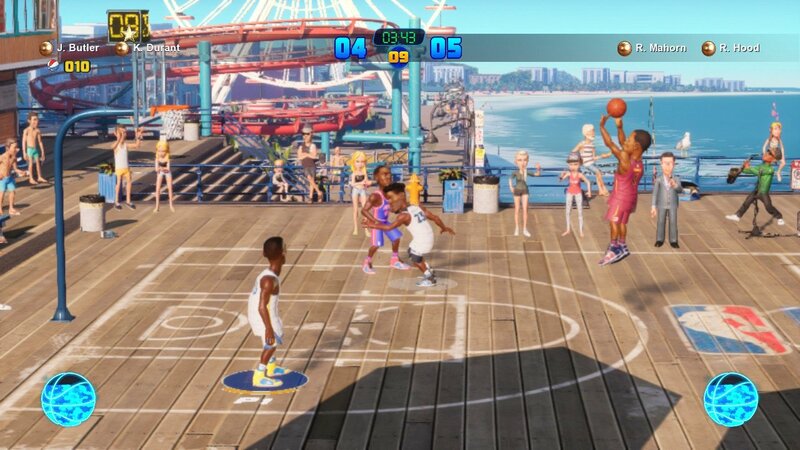 So, with the NBA 2K series now in its sophomore year of unbridled simulation on Switch, Saber Interactive has decided to give Jam’s spiritual successor - NBA Playgrounds - a second shot at on-court glory. Much like that 16-bit classic, NBA 2K Playgrounds 2 is all about turning up the fun factor in the face of actual simulation. Matches are played as 2v2 setups, and dunks, layups and three-pointers are far easier to pull off as a result. As with the first game - which has endured a bizarre existence over the last year thanks to a mishandled attempt at a re-release - plenty of players from the current NBA roster (and many a former icon) are there to be unlocked and customised, and each one comes with their own unique set of stats and attributes. With 2K now on-board, there are more ballers than ever to choose from - including legends of the sport such as Allen Iverson and Shaquille O'Neal - and everything has been given an extra layer of polish. Gameplay still flows much as it did in the previous game (although it’s noticeably a tad slower in terms of pace) and its shot-taking/blocking mechanics are just as forgiving, but character models are also a little better and some of the cartoonish courts boast more variety. The shot clock introduced to the previous game via an update is back, as is the Lottery Picks system (which rewards you with enhanced stats, or debuffs the opposing team) for a brief window, and their inclusion ensures practically anyone can pick up a Joy-Con and be pull off sick three-pointers or blisteringly fast dunks. You can perform double alley-oops on your own, or make the most of your teammate and pull one off together. It takes a little while to adjust to the sheer force of each jump or the timing needed to beat your opponent to a rebound, but once you’ve nailed it, NBA 2K Playgrounds 2 turns into an arcade riot. The meagre tournament setup of the original has been replaced by a new NBA Season mode, but don’t worry about this being some 82-game slog you’d find in other basketball sims. 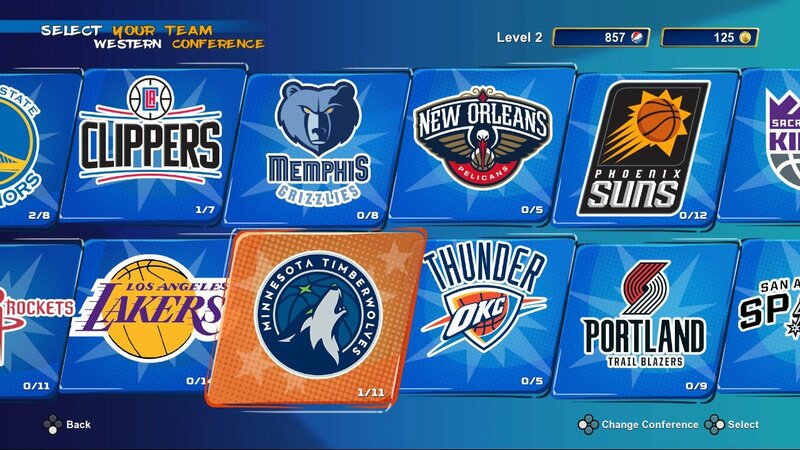 Each run is much shorter and will reward you with a steady stream of in-game coins and a legendary card tied to the team you’ve just won the championship with (we’re big Minnesota Timberwolves fans, so we earned game-changing centre Karl-Anthony Towns for our efforts). There’s also the Playgrounds Championship, which enables you to play locally or online and test just how good your b-ball skills really are. 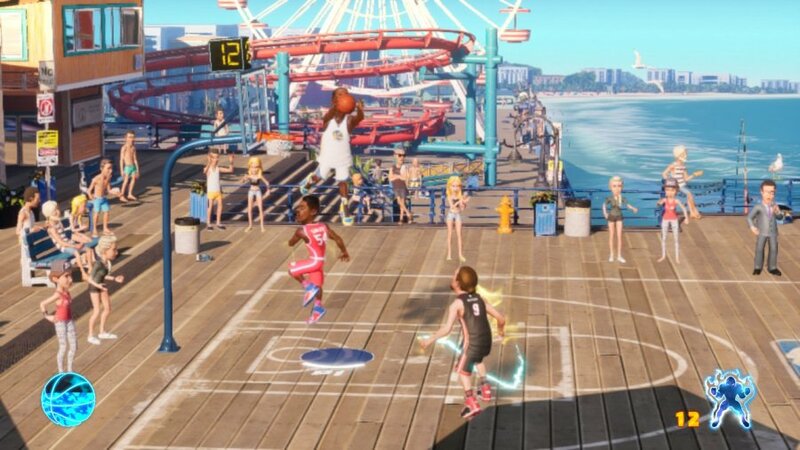 Of course, it wouldn’t be a 2K game without some microtransactions, and the publisher has introduced such a system to NBA 2K Playgrounds 2 - but don’t worry, it’s not as much of a shackle as it is in its other NBA games. 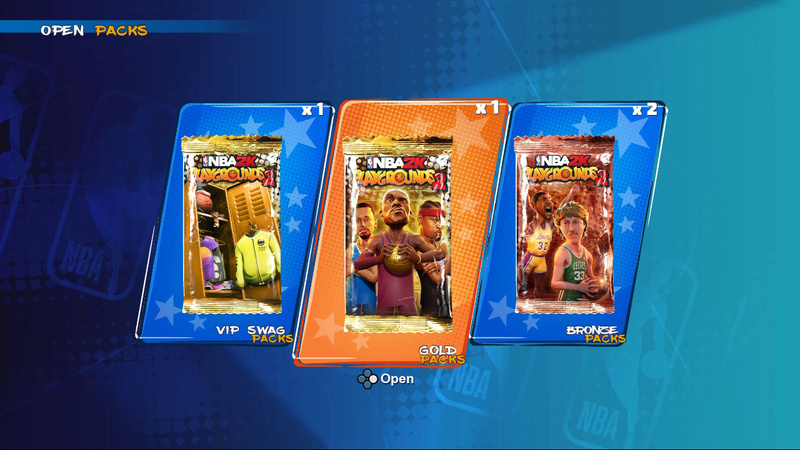 In order to unlock new cards (ie, new players), you’ll need to open packs which can be purchased with Baller Bucks, an in-game currency earned through completing matches and other mini-games. When you first play the game you’ll have access to a couple of free packs which give you access to a handful of players. So when you first play the game you won’t have access to many players, and some teams will be completely inaccessible until you open a pack with a player on that franchise. Thankfully, it doesn’t take that long to start earning these bucks, and you can rack them up by completing NBA Season matches, Exhibition Matches and even performing well in the 3-Pointer mini-game challenge. Alternatively, you can spend 5,000 Gold Coins (which equates to about £5 or so) to unlock every player on the roster. It’s a bit of a cheap move, but this is a 2K game so there was always going to be some form of fast-track opportunity included. Having access to better cards means you can use players with increased stats (so better shot-taking percentages, sprint speed, etc), but you can mitigate this by levelling up your existing player through consistent play. You can, however, cough up real money for Swag Packs and VIP Swag Packs, which enable you to dress your baller up in new accessories and items, but thankfully they don’t offer any tangible benefit bar making you look fresh. While the introduction of microtransactions is hardly surprising considering the history of its new publisher, they don’t hit NBA 2K Playgrounds 2 as hard as might expect. It will take you a while to grind out every player (unless you just buy them all from the off), but it helps that the core arcade gameplay remains as fun and enjoyable as ever. It doesn’t quite capture the blissful mayhem of NBA Jam, but if the main NBA 2K series has always felt a little too realistic for you, this larger-than-life spin-off offers a bright and empowering way to defy gravity like Air Jordan himself. so another game geting slammed for its money grabbing. And like the other 2k basketball game giving next to zero points for playing. Yet gets an 8. Like EA says if its in the game then it should be reflected in the score. @Anguspuss Read the review mate. This could get 10/10s across the board and I still wouldn't go near it. Microtransations are a big no for me so I"m steering well clear. Plus I still kinda regret wasting money on the first one. It's an alright game. I would say not a good local pick up and play multiplayer at all, but a solid single player game. If you're looking for NBA Jam this is not the game you want. It also has almost an RPG like elements added where you do certain things to level up a character. Make so many threes or dunks to add up to 8 points to that player stats. Each team also has a player locked until you win a championship in season play. @Anguspuss Score reflects the review. Microtransactions don't impact progression and it's a better game than the first, which got a 7. @Dom weirdly I thought the opposite. I thought the grind was massively excessive to unlock packs, especially for an arcade sports title. It really feels like it’s pushing you towards that unlock all players transaction through frustration. Maybe that’s just me though. Is the whole thing on a cartridge, or is there a mandatory download? @Mr_Pepperami It's a 2K game so that background push is always going to be there, but I was unlocking packs at a steady rate playing through seasons. But I found the handful of cards I had the start to be enough, considering extended play enhanced my stats anyway. Other sites say that the resolution is under 720p docked. That's an issue if true. I say this while waiting for my new 4k tv to arrive. 4k tvs have upscallers but the higher the resolution the easier it is. Sorry, the game might be good but I just can't support this kind of in-game-purchases implementation. You either give me a great complete game where I want to unlock everything and then maybe buy extra content afterwards, or I don't give you my money. Seriously, the game industry has gotten worse lately with many big companies using their established IPs to get as much money from their loyal customers as they can. I dunno. To me, review scores are a big indicator in determining whether a game is worthwhile to purchase or not. That is ultimately their one objective. But there's way too many factors hurting this game without me playing it. This game, however, is almost twice the price of the first game in Australia (first was $26, this is $48) because it has to keep the same pricing structure as the other machines due to them receiving a physical, something the Switch did not (at least in Australia). The other big off-putting factors (outside the completely unnecessary inclusion of micro transactions, regardless of how little they impact this game. This game arguable does it worse than 2k's main series as it at least lets you play as every player and every team as soon as you start it up which is what you WANT out of a basketball game) are that the visuals clearly look worse than last year's title considering they've had a longer time to work on it and a bigger budget, the frame rate is wildly inconsistent according to analysis videos on YouTube and that, overall it is hardly an improvement on last year's title aside from a few new camera angles and animations. Considering it's a sports title as well, describing it as "great" is a stretch (your website's rating system, not mine. Also inherently the problem with video Game review scores in general. You guys have done a soapbox on that topic before, but regardless that's a whole other conversation). Great is a word used to describe only a select few in basketball. Kobe. Michael. Magic. Dr J. Wilt. Shaq. They are great players. You don't hear people call Channing Frye or Javale McGee or Julius Randle "Greats" yet they all do a pretty darn good job at what they do. This game great? Seems a reach. Again, coming from a basketball fan who enjoyed the first but quickly grew bored of it. And for comparisons sake, I spent 155 hours in 2k18 without spending a cent more than what I paid for the game and got to play with whoever I wanted from the get go. I don't feel like grinding for hours just to play as the Lakers that I want to play as. Have the first game and i think that will be enough for me for when a few mates call over. Other than that NBA 2K19 is more than scratching my nba itch. You guys are reviewers. Influencers. Unless you get some monetary kick back from the publishers, I feel like it's almost your responsibility to warn consumers away from these unfair money-grabbing implementations in these sorts of games. I am a die hard Lakers fan so I generally want to play as an assortment of Lakers players and that's about it most of the time. My initial free packs wouldn't give me "enough to get me by" in the game. You KNOW people just scroll to the bottom to read the score before they make a buying decision. If you have a microphone, use it to /say something/. The gameplay being a little bit better, but twice the price of the first (with no way to now purchase the first game according to another one of your articles) is almost predatory by 2K's behalf. And just because they do it doesn't mean we should all just stand back and be okay with it. @Dom nice review,quite tempted,do you know if you can unlock new players without an internet connection,i.e. Are they all on the cartridge or downloads? You guys are WAY too forgiving on this issue. I can somewhat forgive micro-transactions in a free to play game. But in a 30 dollar "complete" title, it's insulting, greedy and a dirty business practice. I don't care about a sports game like this overall, but the trend it sets scares me. Because I desperately don't want this greedy, dirty, ugly, undesirable business practice to spread. But the cynic in me knows it probably will eventually contaminate the whole industry. The fact that they took down Playgrounds 1 so everyone would be forced to play this money grabbing 2K version is disgusting. I was on their side last year when it took forever to get online going on Switch. They seemed genuinely upset about it and the Shaq Fu offer was more than fair. Too bad they sold their souls to 2K and now reside in the pits of Hell along with that evil empire. So it's better than the first one? Does it feel like NBA Jam now? Getting it physically down the line so I can sell it if I won't like it. I regret buying the first one at 50% off digitally. If nobody paid for micro transactions then we wouldn’t have them, and I think gaming would be far better for it. @luke88 also help if money grabbing got actually punished in reviews scores. Seen a few reviews and gameplay of this and the game is designed to push you into spending more bloody money. The last month they reviewed about 20 games that got a 9/10, so an 8 is actually low. On NintendoLife you need to subtract 2 points of the score on every review. So this is a 6. NBA Jam is an 8 outta 10 game. This one is worse and has microtransactions. You do the math. @Dom agree 100% micro transactions are there but you don’t need them. Finished my first season as lakers - I wanted Magic and I have already earned enough for plenty of packs and it’s more fun doing the NBA seasons than the exhibition grind last year. Iverson is shown on load screens but isn’t unlockable??? Celtic’s lost half their roster from 1st game. It’s annoying. Good game either way and 8 is bang on. @Coach_A as someone who unlocked everyone In first game on Xbox and switch, I can honestly say that VC has no effect on game. I’m unlocking packs at the same speed, especially in NBA season mode. People are hating coz VC is there. It’s there but it’s pointless. Like the unlock DLC last year. @BensonUii rebounding and stealing are now more responsive, meaning pressing the button will now usually make the player on the court do the action instead of them doing nothing most of the time like they did last year. Shooting and dunking are identical to last year. Microtransactions have no place in a game you already payed for. They make the game tedious and grindy in order for you to say "f* it" and buy all the unlockables. If the game is not fun, it's not a game, it's a chore. I like how the reviewer said something along the lines of "it's a 2k game so it's fine". What the heck does that mean? Bruh, you can't tell me you're fine with microtransactions in retail games, you're either lying, filthy rich or stupid. Thanks! I'll redownload the first one and try the shooting and dunking if I can manage. I definitely did not like the stealing, blocking and rebounding part. But I'm glad they "fix it". Grinding is part of so many games, and thats fine. I wonder if people would hate a rpg if you could pay to level up? I mean, you could just grind... But if you have the option to pay it's wrong?... I mean its just an OPTION, you can just... Not pay and grind. The gameplay is good so, I think thats the must important thing at the end. If you like the gameplay then grinding is not so bad right? Other reviewers have noted that it takes a long long time to get card packs, I am going to skip this when I was very excited for it but the microtransaction BS has got me royally off. I just went for lunch with Mikey Jordan and we were discussing this game. He said and i quote "LOL"
Reasons why 2K Games aren't as good as they pretend. They remove a perfectly fun game (NBA 2K Playground) from the eShop, then kept a garbage game (WWE 2K18), introduced microtransactions on another good game (NBA 2K Playground 2), and refuse to make a new better game (WWE 2K19). It's a fun game if you like arcade style sports. Nothing will capture the magic of NBA Jam. That's the effect nostalgia has. It's the Star Wars argument: nothing will be as good as the originals. The gameplay isn't perfect, but it's tight and responsive. The microtransactions are irrelevant. Aside from unlocking the entire roster (offered in the first game), it's all cosmetic. There's no upgrade or gameplay advantage that can be purchased. For sports fans, especially those that like arcade style sports games, 8/10 is about right. You're accepting monetization as the solution to a problem that's being artificially created to justify the solution. If the developer felt that grinding was beneficial to the gameplay, whether that's for training the player or just satisfying that leveling up addiction we have, but recognized that not every player may want to do that, they could easily give player controlled options. You could set your own experience rate, offer in game currency rewards that could be spent on xp rate, etc. I'm very familiar with how Take-Two operates. With every project, it's a question of how do we shoehorn microtransactions into this game? The developer is required, no matter what. They will (and have) tanked good games in the process. The comments sections for reviews on here is really getting tedious now. I personally tend to agree with the reviews in general on here for the most part, I might disagree by a point or so but thats about it, I can't remember a review that was way off base. If a game gets an 8 or above on here that's usually enough for me to go out and buy a game without much other consideration if looks up my street. Yeah, still not getting this. I'm not supporting microtransactions anymore, plain and simple. @Anguspuss Not remotely the point. I'm fortunate enough to not have to worry about how much I spend on hobbies. The problem is that monetization systems affect how a game is played. I won't play another MMO because even if I pay for the subscription service, the game is still oozing with freemium elements. You're constantly reminded of money. @Mr_Pepperami I agree everyone that's not Nintendo life have started that this game is an absolute grind fest compared to the last one, which has been pulled from the eshop to Rob users of choice I guess. Sad times, I have voted na with my wallet. Sorry but this review sounds like the type of review I would read at a disgraced site like IGN: awarding praise and a high score to a microtransaction filled game from a big publisher that is designed to ripoff anyone who gets suckered into buying it from reviews like this. For those doing the maths, you need to play at least 690 games to unlock all 30 epic cards here. which = over 2000 hours of game play or 86 days continues play at least to get them. Now tell me thats a grind or a fffffffffffffffffff scam. @Microjak So far all character in the game are in the rom, so no new additional downloads are required. The whole game can be played without online, less the Championship mode. This is getting uncommon these days... so I really apprecite to be able to play anywhere this game, single and local multiplayer without any online requisite. TBH this game should be free to play. This game isn't easy to play either like nba jam. This game has too many buttons commands. I could just nba2k19 if i wanted a nba arcade-sim. Microtransactions = no purchase, no exceptions. I hate the effect microtransactions have on gameplay, and so I speak to developers the only way I can - with my wallet. Anyone who thinks the game should automatically be slammed with a horrible score just for microtransactions on a "exist or doesnt exist" basis is extremely one sided. Its not a binomial yes/no present/not present slam the game/dont slam the game assessment. Its variable. How bad are they? To what extent do they affect the experience? It's a $30 game where $10 unlocks every character in the game, including all the big names with special moves which wouldnt exist without 2K's involvement. That's worth $10 more to me. And you dont have to agree. But raging against any review that doesnt trash a game's score just because purchases exist... why even bother reviewing the game at all then? If it MUST be trashed for them even existing, then why bother? No. Reviews are to analyze the extent of enjoyment. Not to serve as a tool by which to "send a message" for those crusading in the comments. Im not a fan of MTX, at all, but fair analysis is fair analysis. We dont just flush fair analysis down the toilet to serve an agenda that any game including MTX will get hammered in reviews. That doesnt serve the consumers who are buying games witj MTX. We need fair analysis. If you want to crusade against their existence, do it on Twitter. Not in review scores. Review scores should only reflect the experience at large, and should only trash the game for them proportionately to their detrimental effect. My rule for game reviews is that if they have 2K/EA style micro-transactions I automatically deduct 3 from the final score, so to me this game is a 5/10. So the microtransactions are characters, and you unlock them all with the extra $10? If the $10 gets you the complete package I guess that's better than some of these other monetization models. That being said it still shouldn't be commended, only criticized. your personal score of a game. @PACO_PEREZ but I have the game and I’m saying the grind is ridiculous. Imagine purposely making your game annoying just to sell additional unlocks. I don’t think that’s an ok practice for a game to have. Imagine you bought the new fifa and you were only given a few players and you had to unlock the rest through thousands of hours of grind. Would that be ok?? This is an arcade sports title. You have to play season after season after season after season just to unlock the players in a game you’ve spent money on. You can think it’s ok that’s your right but others are allowed to not be happy with it. @Mr_Pepperami I never said it's ok. I said the review or reviewer doesn't have to thrash a game for that, he/she must make you aware of the fact that the publisher wants more money from you (which is done in this review) and also talk about the other aspects of the game. I saying it's up you you/us to gave that money to this type of games. But the one that deserves to be thrash is the publisher not the review/site. I never have said MXT are a good thing, I saying its a choice, if you dont like them, dont buy this game or dont buy the MXT. Its a new type of option. If MXT exist is because people buy them (clearly they dont go into this site) so let them buy them, and let a reviewer/site give his/her opinion of the review as a whole he clearly didnt decide to put the MXT in this game. The game is on sale ($19.49) for the holiday weekend. That hopefully mitigates the microtransaction issue. So, I think I’m in. I really want an arcade style sport game for the Switch. So I have Dragonball Fighterz on Switch. They offer the entire dlc + future dlc for $35. DBZ Fighterz has quite a few character dlc, each costing about $5. Yet people are not bashing the game for having to purchase all those dlc (and some characters can only be obtained by purchasing the dlc). The microstransaction setup in NBA2K Playground 2 is not that different to if they were offering a dlc that offers to unlock all players and any future player downloads. In DBZ Fighterz you have to grind to unlock other DBZ characters. 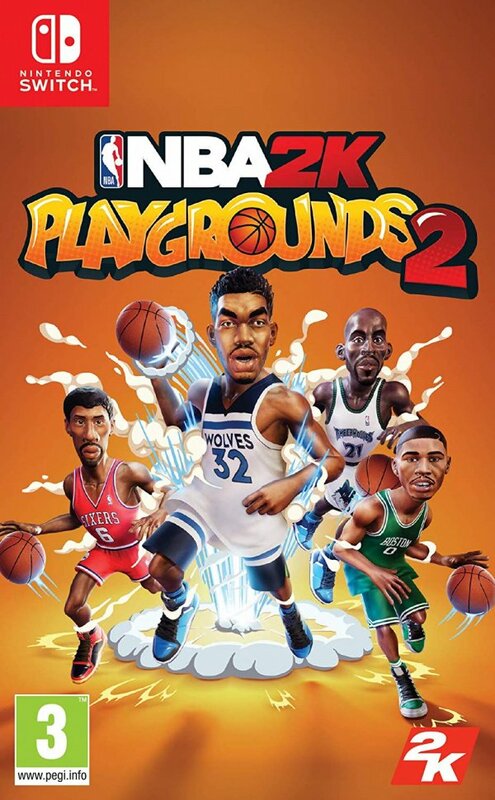 NBA2K Playground requires that you grind to unlock basketball players. I'm not defending FighterZ either, but a season pass is a lot better than selling you fake in-game currency for real money.